Baby shower will make mom feel as special as she is. Today marks 34 days until Ava Kalea Kennedy is scheduled to make her first appearance. Stacia and I are both super excited – and it seems that lots of friends and family are sharing in our excitement. 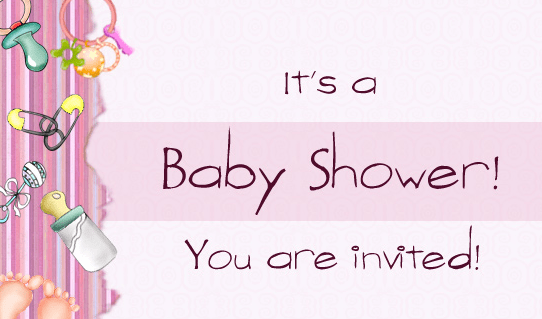 One of Stacia’s bosses at Fortune Builders is planning on throwing her a baby shower on Sunday August 28th. This is really super cool because we’ve only been here in San Diego since February and haven’t made a huge number of friends yet. It will be nice for Stacia to have some friends and co-workers celebrate the impending birth of Ava Kalea. There were rumors that some of Stacia’s friends and family may be coming down to throw her a baby shower this month, but I guess it just didn’t work out. Now there are some who claim that they are planning to come down around the time that Ava Kalea is supposed to be born, but that’s definitely NOT the ideal time …. (there’s going to be a lot going on – and we just don’t have that much room). At Stacia’s doctor appointment yesterday, her midwife told her that the baby’s head is already down in the pelvis and that she is positioned to make her entrance to the world. Thanks at least in part to being diagnosed with gestational diabetes earlier in the pregnancy (I’ll write about that experience in another post), Ava has not grown too big. Although she is already long, she won’t be overly big or heavy. More than anything else, we are just hoping that she is as healthy and happy as possible. There is also some great news coming up regarding Daddy Blogger World and I look forward to sharing details with you and all our readers in future posts. We will be having some super smart guest posters – as well as reviews on some really, super cool baby products. I’ve also been working on collecting and compiling more recipes for healthy baby food – most of them that we can make in our Vitamix Blender (well, we are really still using a Blendtec, but I work with Vitamix, so that is the blender that I promote – and prefer). If you have any healthy baby food recipes, please contact me and clue me in. Thanks for reading – your comments and suggestions are super welcome – and of course you are invited to Stacia Kennedy’s Baby Shower on August 28th.